At the ages of seven and almost five, my children often say funny things. Long ago a friend recommended that I write down their cute little sayings, insisting that I wouldn’t remember. It was one of those ideas that made perfect sense at the time and yet is something that I just never did. And, although I thought I could rely on my very good memory, I don’t remember all the cute little things they have said over the years. The only ones I remember are those I wrote down on this blog, captured either with my phone or the flip camera, or the ones I told so many times that they are burned into my memory. And now for some clarification. First of all, Taco Time is not Taco Bell. It is a locally owned fast food-ish place where the emphasis is on fresh. I haven’t eaten at Taco Bell since my early 20′s but I don’t mind Taco Time. Second of all, I’m not a drive-thru kind of person but last summer our beloved babysitter took them through there and on to the park where they had a picnic. They are still talking about it six months later. Third of all, when Graham was the praises of my food, he was not talking about this Two Potato Vindaloo. He was talking about a taco (sense a theme?) that I made him with black beans, cheese, homemade salsa and guacamole. So no, we are not quite at the point where I feed my children Two Potato Vindaloo although I think that Graham, my hearty and relatively adventurous eater, would probably have liked it. I have, oh, about one ton of leftovers in the refrigerator so maybe we will give it a try tonight. I know that Spencer would not touch it. But I bet, if I opened a take-out window in my house (a friend on Facebook called it the Dana Treat Drive Thru), I would sell out of this dish. This recipe comes from the beloved Plenty cookbook. I swear this book has magic powers. I feel like each time I open it, there are delicious things in there that I have never seen, never noticed. 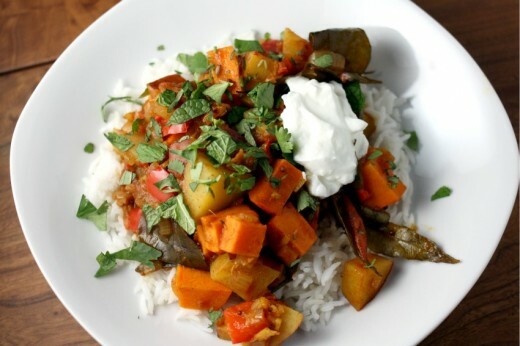 This recipe, starring both red potatoes and sweet potatoes, I always notice and the only reason I haven’t made it until now is that I don’t always have fresh curry leaves on hand. You could, of course, leave them out, but I dearly love curry leaves and just the scent of them as they hit the pan reminds of me the year we lived in London and all the amazing Indian food I ate there. I made a few changes, streamlined the cooking time. Ground spices instead of toasting whole ones and then grinding them. Canned tomatoes instead of fresh (have you seen “fresh” tomatoes in Seattle these days? Yuck.) I have the British version of the book so I always tweak the recipes a bit with the measurements and all. Having made so many delicious things from this book, I have learned to trust Mr. Ottolenghi’s taste. I hesitated at the amount of vinegar in this dish but the acidity cut through the any heaviness that curries can sometimes have and also helped boost the flavor of the spices. I’m telling you, that man is a genius. The only other thing I can add is that, unless you are vegan, definitely add a dollop of plain yogurt to your bowl. 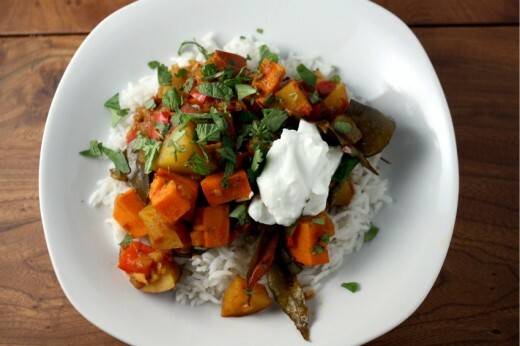 More acidity and some creaminess are most welcome in this curry. Unless you live near an Indian grocery, fresh curry leaves can be hard to find. If you do use them, they are totally edible. I like the way they taste but you can also pick them out like bay leaves. I know some people substitute bay leaves for curry leaves (I haven’t tried it – the flavors are not the same), but if you do I would only use four of them and be sure to pick them out before serving. Don’t worry if you don’t have fenugreek seeds – just leave them out. In a small bowl, combine all the spices except the mustard seeds and fenugreek seeds. Set aside. Place a large heavy based pot over medium heat. Add the vegetable oil along with the shallots, mustard seeds, fenugreek seeds, and a large pinch of salt. Sauté for about 8 minutes, or until the shallots brown. (You might want to have a lid handy in case the mustard seeds start to pop.) 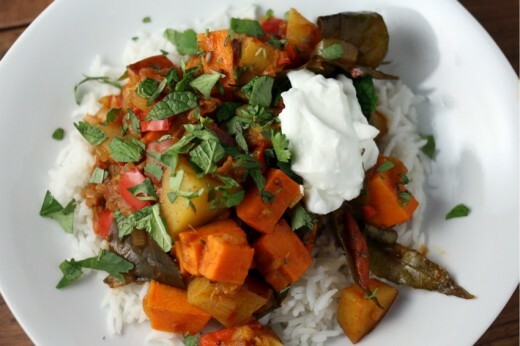 Stir in the spice mix, curry leaves, ginger, and chile, and cook for a further 3 minutes. Add the tomatoes (with their juice), vinegar, water, sugar, and another pinch of salt. Bring to a boil, then leave to simmer, covered for 10 minutes. Add the potatoes and red peppers and simmer for another 20 minutes. For the last stage, add the sweet potatoes. Make sure all the vegetables are just immersed in the sauce (add more water if needed) and continue cooking, covered, for about 20 more minutes, or until the potatoes are tender. Remove the lid and leave to bubble away for about 10 minutes to reduce and thicken the sauce. Serve hot with plain rice and garnished with herbs. Serve yogurt for garnishing at the table. I love the idea of a Dana Treat drive-in – a measure I fully support :) I got Plenty as a gift for the holidays and I can’t wait to dig into it. I’ve never even seen a curry leaf so I’m curious and wonder if it’s time to take a trip into Little India for some. Gorgeous photos too. This looks yummy and I would go through your drive-thru. Wonder where I might find curry leaves in the Tri Cities?? Thanks Dana! Like Jeanette, I received that book as a gift over the holidays, and have been meaning to make something from it. There are so many to choose from that I couldn’t decide until now. I just need to find fresh curry leaves here in Vancouver. I love ethnic food, and I would certainly buy this from a food window, haha. Glad to have found your blog, looking forward to reading more. Thanks for sharing! It seems we both have two potatoes on our mind this week. This sounds wonderful, and I am a huge vindaloo fan. Will have to give this one a whirl. Have to agree with you on the Plenty cookbook; out of all of the ones I read last year, this one stays with me, time and time again! Kids are cute!!! I wish I would have written down the crazy things my kids said. I received Plenty for Christmas and have been drooling over everything in it too! Everything I’ve made so far has been amazing. I was really curious about this recipe and just so happen to have everything (besides the curry leaves), so I’ll have to try this one next! I need to make this soon! I just made this last Sunday and it is lovely! I also really enjoyed the Mixed Beans with Many Spices and Lovage, served with the Coconut Rice. What a beautiful book! You are right- this cookbook is magic. I have made multiple recipes and they are all so fresh with amazing combinations of flavors. I will look for the vindaloo and give it a try too! Got Plenty for Christmas! Making the lentils with slow roasted tomatoes, gorgonzola, and picked red onions this week. Screw the drive-thru; I want delivery. You do that, right? I’ve passed up curry leaves before at the Indian grocery near my house because I’ve never quite figured out how I’d use them. So thank you for an excuse to get over myself and give them a try. Your theory about this book is totally spot-on…because i feel like I’ve never seen this recipe before IN MY LIFE and I flip through that book CONSTANTLY. A definite need-to-make. If I lived in Seattle I’d be driving thru by your window daily. Who are we kidding. Multiple times a day. This looks beautiful. And, after reading the ingredients, I can almost smell this cooking in your kitchen. Taco Time is a weekly guilty pleasure of mine. Thank you for making me feel better about that, too. I have been meaning to add Plenty to my collection of cookbooks for some time now. I hardly ever cook with potatoes but I think this recipe would be a good place for me to start since it’s combined with so many other, really great ingredients. Got Plenty for Xmas and been meaning to start cooking from it. Made this tonight and loved it. I couldn’t get curry leaves but it was great without .. I added some chopped cashews on top cause I wanted a little protein. Thanks for getting me started on this cookbook Dana! What a great idea to write down all the random awesome things your kids say, I’ll have to remember that. :) This vindaloo sounds delicious! I love all manner of curries, especially ones with curry leaves in them! 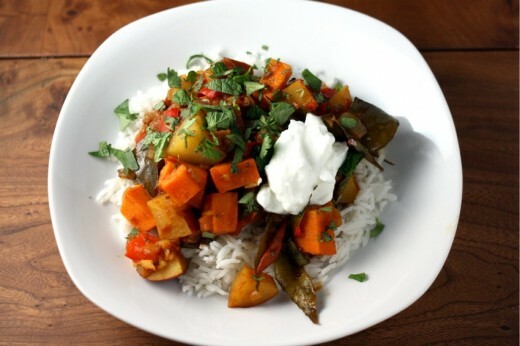 If i wanted another dish to go along side (i always like a variety of curries), would you reccomend a dahl/chickpea/protein one, or something with less starchy vegetables?